It's the 20th anniversary of World Body Painting Festival, Austria. Make yourselves available from July 28 - 30, 2017 at Klagenfurt at the Lake of Worthersee, Austria. 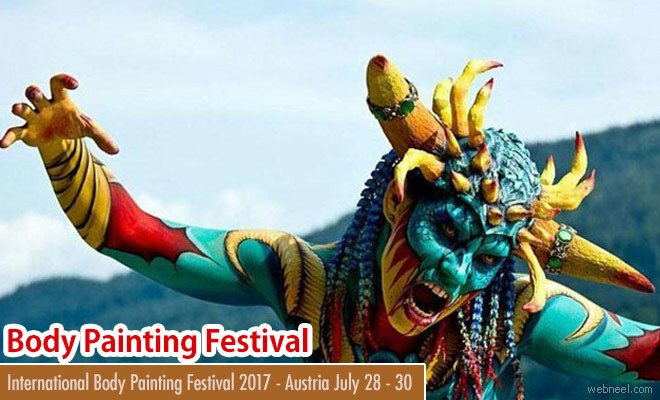 The festival has a very long tradition and it's believed that modern bodypainting art movement started in Carinthia. Artists from more than 50 different nations will do their best to stun and entertain visitors at the 20th anniversary of the World Bodypainting Festival, the world championships for Bodypainters. High quality Art creates a special experience for all visitors of the Open Air art park "Bodypaint City" combined with music and shows. The venue is situated in the inner city of the state capital Klagenfurt and framed picturesquely by the historical buildings of the theatre, the art house and the city gallery. Additionally this charming place offers a varied range of bars, cafés and restaurants, ideal possibilities for the WB Academy program and the side events. There are plenty of awards in store for the best body painting artists. Friday and Saturday: "Utopia – what vision becomes your reality"
Sunday, Final day: "Customs & Traditions – tell us about yours"